LLDPE is a film that has higher tensile strength and higher impact and puncture resistance than it's cousin LDPE. It is very flexible and elongates if stressed. It has good environmental stress crack resistance, and is resistant to chemicals. Bring us your biggest job and let us show you how well priced we are! View a chart with geomembrane lines, their thicknesses, applications, longevity and material composition. 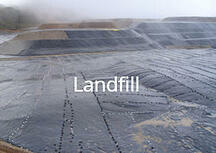 Used for wastewater containment liner, impoundment liners, water water lagoon liners and more.